This document is a chapter from the ‘Band on the Wall, Historical Desk Assessment’, by Fergus Sutherland, of iCosse, January 2007. Permission to hold an annual fair in Manchester was first granted in 1222. Initially the grant was for a two day fair, but this was increased five years later to three. It was held between the 20th and the 22nd of September, on a piece of arable land next to the town known as Four Acres or Acresfield. In 1708, Lady Ann Bland was granted an Act of Parliament to enclose Acresfield and build a church there, but a condition was attached to the effect that she had to preserve an open space thirty yards wide in front of the church to enable the fair to continue. (Hylton, 2003, 12). By this time, St Ann’s Square (as it now was), was surrounded by the homes of the well-to-do of Manchester, who had to endure the unwashed masses making merry outside their front doors for three days each year. In 1808, well before the incorporation of the borough, there had been a proposal to buy out the manorial rights to run markets. Sir Oswald Mosley was earning about £2500 a year from his manorial rights and he offered to sell them to the town for £90,000. This was rejected as excessive and it was not until 1846, exactly 250 years after Mosley’ s ancestor Nicholas had bought them for £3,500, that the manorial rights were finally acquired by the borough. By this time, £3,500 also happened to be the income that they generated, and Mosley’s price had gone up, to £200,000. This was paid to him in instalments, with £5,000 down and £4,000 a year paid to him and his descendants. Only in 1894 did this last vestige feudal influence over the town’ s government end. In 1820 the potato market was moved to the site of the gardens to the east of Shudehill. The land had been leased a few years earlier from the Earl of Derby by Sir Oswald Mosley who paid to have it levelled and drained. 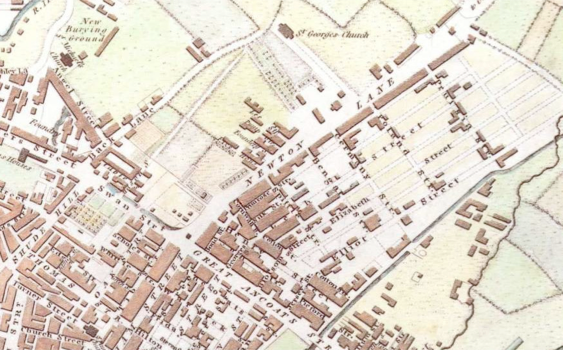 Acres Fair removed to the newmarket in 1821, followed by the butchers and greengrocers (from New Cross Shambles) and then the meal and flour market. 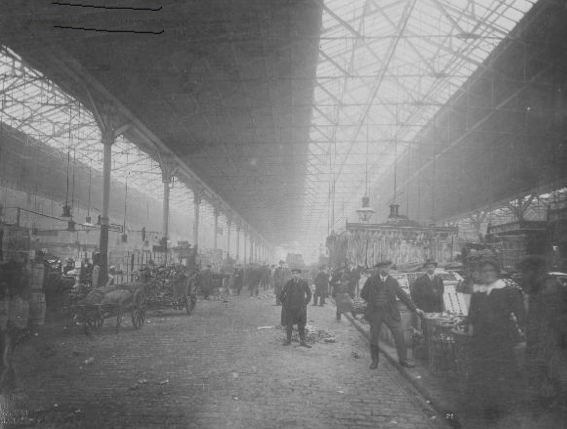 It was officially given the title of Smithfield Market in May 1822 (Axon, 1886, 163). Originally the new market operated as a largely open space with rows of curved shambles in one corner and a piazza along the southern edge. The acquisition of the market rights by the incorporation in 1846 was followed in 1850 by the purchase of more land on the eastern side of the market between Coop Street and Oak Street which was used to reorganise the market traders into more clearly defined wholesale and retail sections. 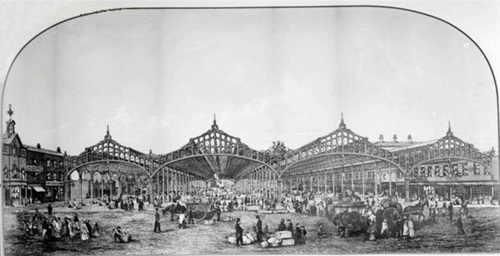 In 1853-4 the market area was roofed over with four vast arcades of cast iron and glass, erected by “Mr Wheeldon of Derbyshire” under the superintendence of William Fairbairn. In 1857-8 a new but chers’ shambles was erect ed on t he sit e of t he earlier one at 39-45 Swan Street (Grade II listed). Designed by Isaac Holden as a square, classically styled, single- storey building, it originally had an open inner courtyard which was roofed over with cast iron trusses in 1868. In1865the first section of the Retail Fish Market was built on the south-east end of Smithfield, at 17 Oak Street. It has been demolished, but the extension (1888-9 and 1915), with its elegantly glazed end gable wall and wide arched opening to Oak Street, has survived. A large rectangular building, it retains its outer brick and stone walls but inside it is roofless, having lost everything but one row of cast iron columns. The elaboration of its High Street elevation, with its moulded brickwork and carved stone tableaux depicting scenes relating to fishing, reflects the fact that it faced then main approach to Smithfield Market. At the end of the nineteenth century the favoured focus for a Saturday night in town was around the top end of Market Street along Oldham Street, and in Shudehill. The main Manchester Market in Shudehill traded all through Saturday, and provided plenty of entertainment and free am usement for families, couples, women and children. Shudehill – and also the Flat Iron and Cross Lane markets in Salford – came alive on a Saturday night, with crowds of shoppers and sightseers, and stallholders entertaining and cajoling with their spiel. Most shops were open, and the main street were lit up and packed, the town brightly gas-lit and bustling, and there was the added incentive that nearing closing time at midnight food became cheaper. And again the big crowd – in a single day in 1870 it was estimated that as m any as twenty thousand people went to Shudehill – attracted beggars, musicians and entertainers seeking an audience. Smithfield Market closed in 1973 after a century and a half and its tenants moved to New Smithfield Market in the outer suburb of Gorton. It was by a considerable distance the major employer in the area and effectively the local economy collapsed and the heart was ripped out of the community when its doors closed forthe last time.